Marebello offers a range of suite types and sizes including Premium, Superior, Reserved Plus, Reserved Dementia, Reserved and Reserved Twin. Each room has a unique feature such as a balcony or direct access to the gardens. The large (22m2 - 28m2) and homely Reserved Twin Suite comes with a shared ensuite. This suite is fantastic for couples. The very homely and comforting Reserved Suite provides a comfortable abode for a single person. 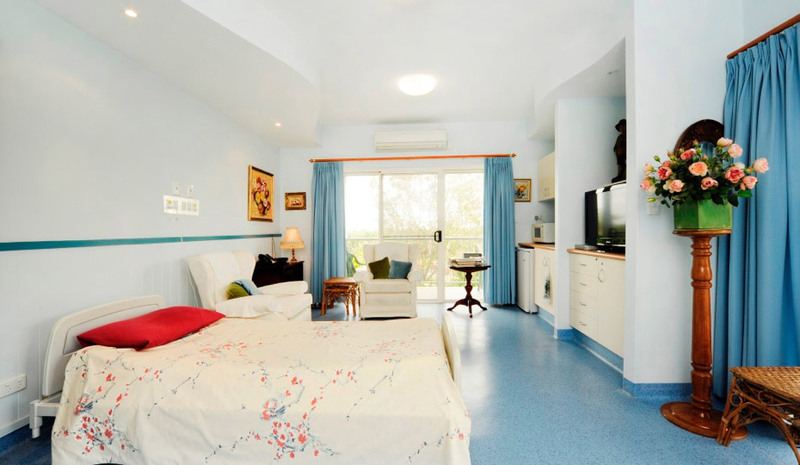 The 15m2 - 18m2 room has a private balcony and a shared ensuite bathroom. Residents in the medium sized (15m2 - 23m2) suite enjoy their very own private ensuite and patio. The 18 bed Specialist Care Suites have special access to a large secure garden and grounds to enjoy. The medium (15m2 - 20m2) sized Reserved Plus Suite is a single private room with an ensuite and balcony. You can find your own comfortable space in the single Superior Suite. These large (18m2 - 22m2) suites have their own private ensuite and balcony or patio. The very large (22m2 - 28m2) Premium Suite, located in a highly sought after position, provides ample space to feel at home. This suite includes a private ensuite, kitchenette and balcony or patio.